Meet Mason Buttle, age 12, underdog. Even his name makes you cringe just a little bit when you first hear it, ripe material for those bullies who inhabit school playgrounds and hallways, and they do get plenty creative with it. Mom killed by a drunk driver and Dad long gone, Mason has lost more than his fair share in his eleven years. He's got a lot of things stacked against him. These days Mason lives with his uncle and his grandmother in a house that is filled with falling apart and crumbling down. But inside he just might be a champion. Every day when the school bus drops him off back home Mason has to strategize. How will he make it safely to his own front door. A gang of bullies led by the neighborhood jerk named Chet is ready to pelt him with words and rotten apples and anything else that crawls into their imaginations. It's not a question of will it happen, it's a question of how will it happen. Sometimes the threat of trouble comes from a different corner. Sometimes it's the car of the local police detective that Mason sees waiting in his driveway. Mason's best friend, Benny Kilmartin, is dead. Mason was the last person to see Benny. 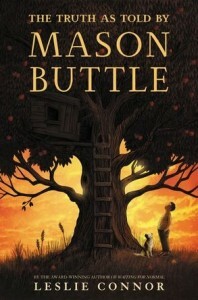 The two of them had been playing in their tree house together and this policeman, Lieutenant Baird, is dead sure that Mason knows how it happened and isn't telling. Baird pushes and pushes while appearing to wait and wait. But Mason struggles with words and just can't come up with anything to satisfy the lawman's made up mind. One day things change. Going into the resource room at school, Mason spots a fluff of whitish blonde hair sticking up from the vicinity of the couch. That fluff turns out to be a boy named Calvin Chumsky and a friendship is born. These two guys start hanging out together after school and being adventurous types, they discover a fantastic cellar near Mason's house which they transform into a hideaway. Mason has challenges. He struggles to write words on paper and he has synesthesia. His best friend, Calvin Chumsky, is one of the best things to come into his world until he goes missing and everyone is looking at Mason, again. How does one boy stand up against so many people who are trying to bring him down? Lucky for both of these boys there is a teacher who offers the balance of compassion, love, empathy, looking beyond the surface...everything each one of us longs for in our own lives. Each time she appears, there is a break from the ugliness, the fear, the rage and the indifference that pours out of the others. This one will touch your heart in the best way. This one will stretch your heart in the best way. Mason joins the ranks of Augie (WONDER) and Melody (OUT OF MY MIND) as characters who have been stereotyped by those around them but who have so much treasure just waiting under their skin. The Buttles have owned these apple orchards for generations. Why have the house and orchards now fallen into such an extreme state of disrepair? Why has Uncle Drum been selling off the acreage? What’s wrong with Uncle Drum, who sits around in the diner all day doing nothing. Why has he brought home a young runaway woman he encountered at the diner, who couldn’t pay for her meal? Why did he give her Mason’s bedroom to live in, and often provide her his credit card to indulge her obsession with TV shopping channels? Why does Mason see colors that aren’t there for anyone else? Why does he see words swirl when he tries to read, and why does he sweat so much? How can he be so equanimous about his disabilities and being constantly bullied? Most importantly, what really happened to Mason’s long-time best friend, Benny Kilmartin? Mason was the one to find Benny dead at the base of the treehouse in the middle of the Buttle apple orchards. That was a year-and-a-half ago. Lieutenant Baird from the Merrimack P.D. has spent that year-and-a-half relentlessly pressuring Mason for additional information that he’s sure Mason is withholding about Benny’s death. In addition to Lieutenant Baird, two of Mason’s peers, sadistic lacrosse players Matt Drinker and sidekick Lance Pierson, are making Mason’s life a living hell with their daily verbal and physical attacks. Matt lives in one of those houses built on what had been part of the Buttle apple orchards. Complicating the situation is that Matt’s mother often hires Mason to take care of their dog Moonie. Fortunately, Mason, the largest seventh grader in the school, becomes friends with Calvin Chumsky, a smart, inquisitive kid and one of the smallest kids in the school. Calvin also lives in a new house on former Buttle land. The real heart of Mason’s story is the friendship that develops between the pair. When he’s with Calvin, we can see the stand-up kid Mason Buttle is. Mason does find some refuges. In school, he often hangs out in SWOOF, the office of caring and empathic social worker Ms. Blinny. She sets Mason up with dictation software that enables him to tell his story and try to puzzle out what happened to Benny without needing to put pen to paper. At home, to escape from the bullies, he and Calvin construct an amazing subterranean hideout that includes painted replicas of the artwork in the famous Lascaux caves in France. With Ms. Blinny and Calvin there for him, life is tolerable. But the sudden development of a new mystery brings everything to a head. The innocent and naive Mason comes to realize, for the first time, that townspeople and Lieutenant Baird, and even Benny’s parents, believe he was involved in Benny’s death. This devastates him. There are intriguing aspects to just about every character in the story. I love the character development in Mason as well as the members of the supporting cast: Calvin, Uncle Drum and Grandma, the cop, the young woman living with the Buttles, and the social worker. Hey, even the dog is a character I won’t soon forget. The character I’m still trying to get my head around is Matt Drinker’s mother. There are lots of books for young people that include bully characters, but so few of them give us a look at the parent of a bully the way that this book does. How does Mrs. Drinker respond, having just observed what her son just did to Mason? She does next to nothing! She asks Mason if he’s okay and calmly tells Matt that he has to go in the house and that his friends have to leave. Matt has no shame. First he argues against going in and, when Mrs. Drinker puts her foot down and insists that Matt do so, Matt shoves her aside as he enters the house. What gives with this kid? In this age of #MeToo, seeing how Matt Drinker treats his mother without consequences, I cannot help but anticipate that it will be only a few years before Matt is unashamedly taking whatever he wants from whichever young women are unlucky enough to attract his attention. Has Mrs. Drinker, herself, been a victim of abuse? Is Matt’s behavior the result of indulgent parenting going awry? Kids like Matt don’t develop into adolescent bullies without the parents knowing it. What role has Mrs. Drinker played in this development? There are so many facets to this story. Together, they make for a powerful, captivating, and heartwarming read about a kid who is truthful, loyal, and trusting. The only thing missing are instructions for the yummy apple crisps his grandmother bakes. But don’t worry; I make apple crisps all the time. Feel free to email me and I’ll send you my recipe.